For a democratic secular Iran. For peace and prosperity in the Middle East. 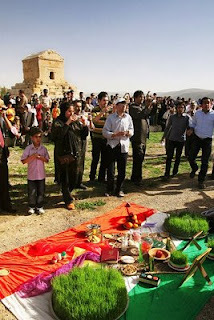 : What Better Way to Celeberate Nowruz? What better way to celebrate Nowruz? 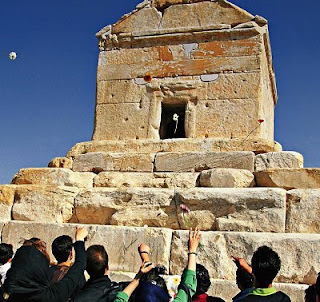 with the Haft-Sin decorations right next to the tomb of Cyrus the Great, the father of our nation and then throwing flowers at his tomb. Now I am really feeling home sick! This is a beautiful act by our compatriots. The Islamic/Muslim occupiers will never break our strong cultural and historical bonds/roots. Glad to see these pictures. Any News from your beloved Friend and Political Ally Fakhravar ?!!!!!!!!!!! !